The Shiatown Dam is in disrepair and potentially threatens life and property. It nearly failed during a high water event in February 2001. Shiatown Dam is a run-of-the-river structure in the Shiawassee River, a low gradient, warm water river that drains 1260 square miles of central Michigan. The dam no longer serves an economic purpose, and many of the recreational benefits of the impoundment have disappeared as a result of dam deterioration, sedimentation and poor water quality. 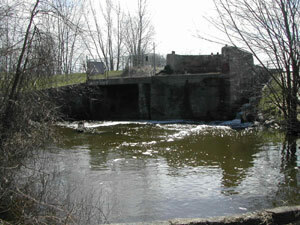 County residents and the owner, the Michigan Department of Natural Resources, agree that action is necessary to prevent failure of the dam and to restore the value of the site. We defined the relative merits of dam repair, replacement, and removal by conducting ecological, social, and economic assessments at local and watershed levels. The cornerstone of our social assessment was a mail survey of 1500 people with a 43% response rate. Respondents greatly value the dam and river for historic significance and passive recreational opportunities. Survey results show 78% support restoring the dam despite known problems at the site. The Michigan Department of Environmental Quality, dam safety regulator for the state, has recommended major repairs for all parts of the dam. On average, $12,000 annually has been spent on reactive repairs over the last 30 years; no funds have been available for preventative maintenance. Issues to consider in any decision about the dam include an unknown amount of PCB contamination in the sediment, human safety, recreational opportunities, historical preservation, aesthetic value, ecological impact and cost. Opportunities exist to increase public education and to improve the adjacent county park. We describe and recommend a collaborative decision process for stakeholders to undertake to reach a decision on the dam. Our project conducted a design charette to demonstrate one creative approach to envisioning a positive future at the site. 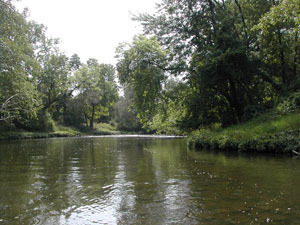 Our client, Friends of the Shiawassee River, has agreed to initially lead a collaborative process.